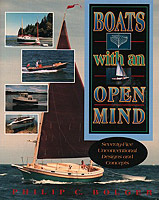 Phil Bolger's Boats with an Open Mind is a must-have for every small-boat enthusiast. This detailed and illustrated 406-page text features 75 designs and concepts, including the Micro, Chebacco, Martha Jane and Birdwatcher series. Soft cover.